The power right now is definitely in the cards: Command Cards that is! When the Jabba’s Realm expansion and corresponding wave of figure packs released late December 2016, a flood of Command Cards came with it that greatly increased the power level of the game, introducing a much more agro style of play to Imperial Assault. Cards such as Assassinate, Tools for the Job, and Heightened Reflexes ensure that your 6 to 8 point figure has a decent chance of dying given your opponent is holding several of these cards in hand when attacking. 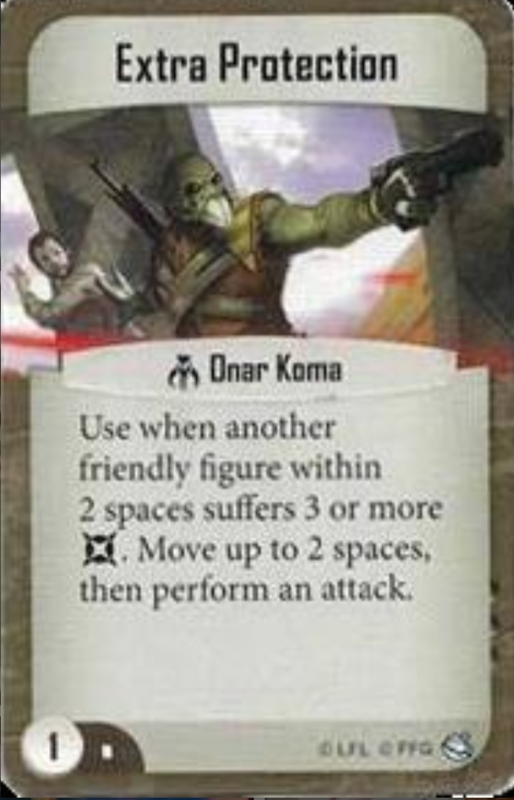 Let’s face it, with Jabba the Hutt and Black Market helping Mercenary players draw even more cards, it’s fairly likely that by the middle of round 2 they already have 6 or 7 cards in their hand so yes, it’s fairly likely they have several of these cards. So what’s a player to do? It’s basically “beat ’em or join ’em,” and it seems that most people are taking the latter route, as evidenced by the most recent Worlds Championship top 16 in May, as well as general tournament reports over the past several months. Mercenary Hunters have basically dominated the meta. We’ve seen more variety as the most recent wave of Droid-related figure packs were released recently, but I would argue that in some ways the wave only exasperated the problem. 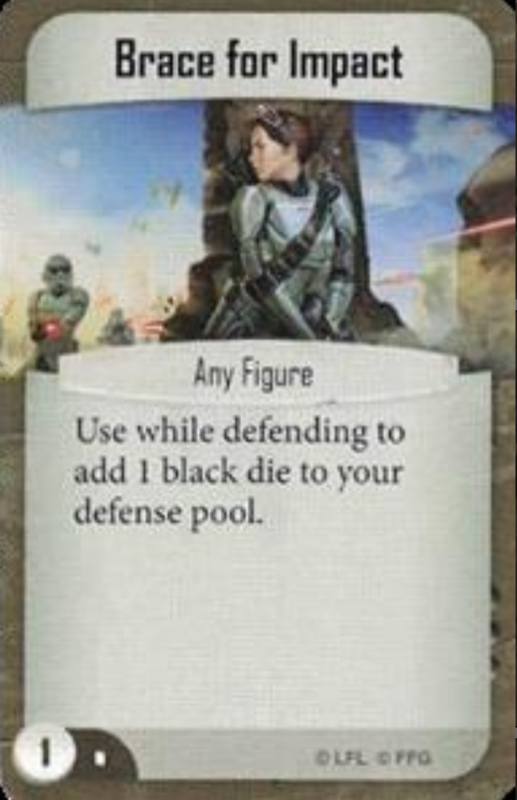 The ability to bring a BT-1 into a Mercenary list with an Elite Jawa is amazing, and just one more reason I am loving this Command Card: Bodyguard. Disclaimer: I was definitely not one of the first people to figure out that Bodyguard is really effective in the current meta. I recently saw it on a forum, and actually I think it was referring to someone using it to keep a Hunter alive (go figure). Being anti-meta as I am, I saw this as an opportunity to make something else more viable in the current environment. So I had two thoughts: first, what is one of the best late-game figures in IA and secondly, how can I capitalize on this strategy to make the Guardian figure I’m playing it on more last longer? In answering my first question, I looked first at Luke Skywalker: Jedi Knight. Luke is an amazing late-game figure. He can attack twice in a round, assuming he can close in on his target(s) and four times if you’re holding his Command Card. That’s amazing! Better yet, if you have C-3PO or Gideon still alive and can focus Luke once a round, he can be a real wrecking ball. There is probably a better choice than Luke, but as a Rebel player primarily, this was a natural one. As a bonus, Luke is also really fun to play! Next, and here is where I am having a lot of trouble deciding, what Guardian do you use? If you want to keep it purely Rebels, you can go with Gaarkhan. Yes he is not the most competitive figure, but I’d argue he’s also not terrible. He doesn’t hit like a truck, but he is a 10 hp figure for 8 points that can move EIGHT spaces, then attack! Additionally, he can focus himself after attacking (not unlikely with a Red/Yellow attack pool), attack a second time if he’s taken any damage and with his charge ability he can still get some movement in between those attacks! Gaarkhan is what I’m calling an Assassin type of figure, which is what Ahsoka Tano will be in my opinion. Both Gaarkhan and Ahsoka have really good movement and can move across the board to take out something that is at low health or just really want to kill. He is super fun to play when he works effectively; people will often underestimate him. 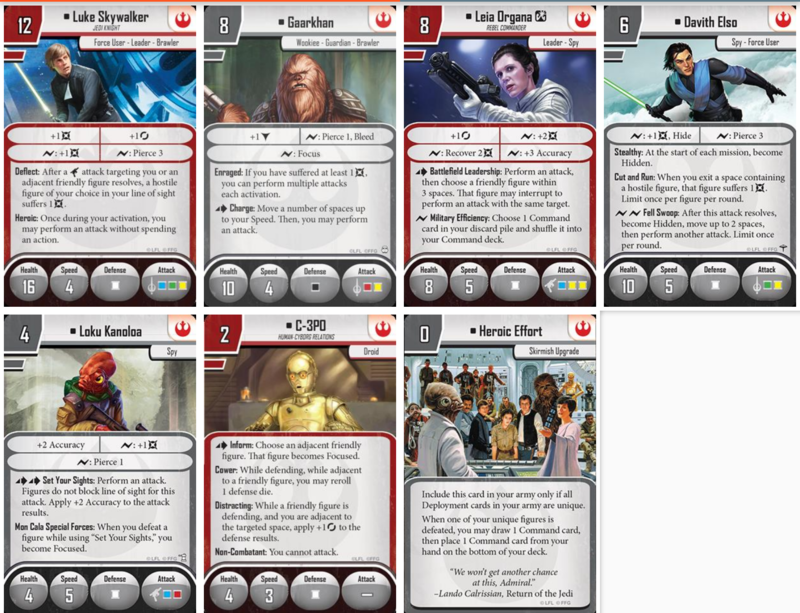 My initial Rebel list uses Gaarkhan/Bodyguard to protect Luke & Leia. It also has all the fun Spy cards. My other idea for using Bodyguard to protect Luke was to bring him into a Mercenary list and run some Gamorrean Guards. I settled on the Elite version, simply because of the cost-effectiveness, and even though their job is to die to protect Luke, I figure the added health for the chance to play Bodyguard on the same Gamorrean plus the vastly superior attack gained from the Elite version makes the extra 2 point cost very worth it. Gamorreans are a great fit for Bodyguard. They are 8 health for 4 points a piece and have their Gamorrean Honor Guard ability, which adds one block when defending against a ranged attack. I’m 2-2 with this list and, given more practice and slight changes, I think it could perform better. The small number of activations can be a problem, but Bossk and Luke on a team can be downright scary! 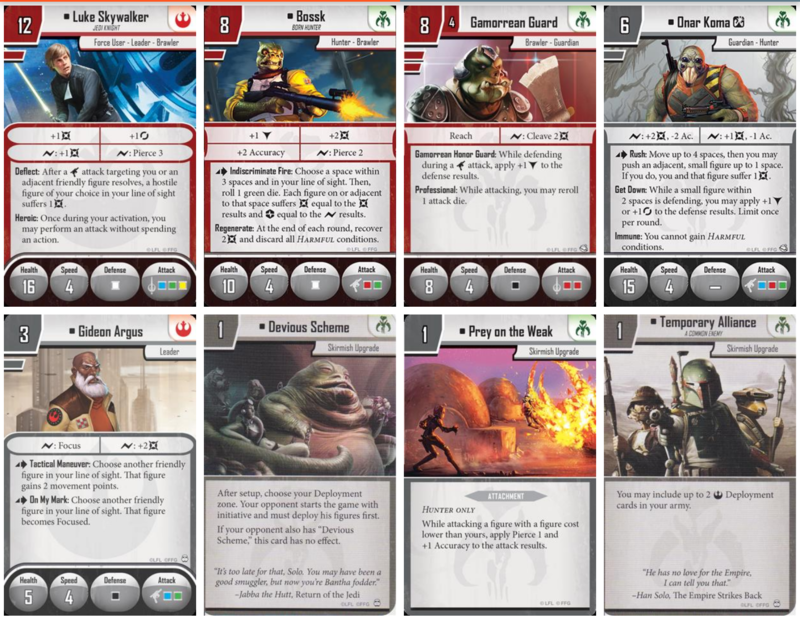 To further capitalize on the Gamorrean’s tankiness and natural defense, I like to run other Command Cards that could work for both the bodyguard and bodyguarded (below are some ideas and cards I’ve run). Onar works great in this list archetype. His “Get Down” ability is very usefull. 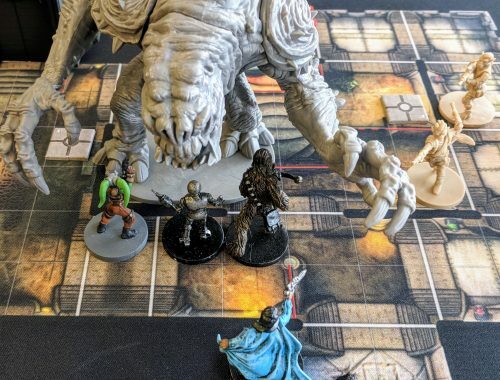 You can play Bodyguard on him first, or you can let your a Gamorrean or your key figure take damage, then use Extra Protection to put Onar in position to Bodyguard later. 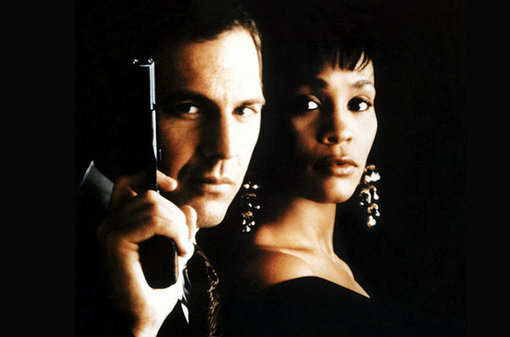 I’m not saying that either of these lists are the most competitive or even effective uses of Bodyguard. Rather, they are the first thoughts in what will likely be a long history of utilizing the card to create fun, playable armies that are counter-meta. 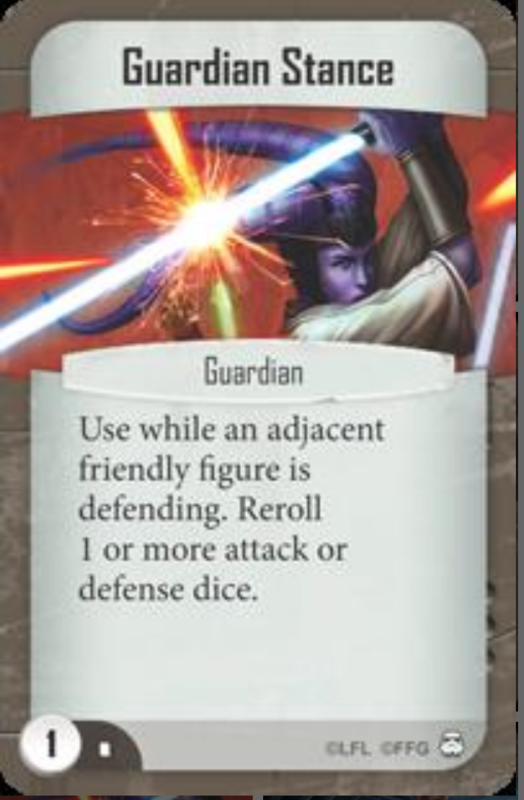 There are a couple play styles that, in my opinion, counter the effectiveness of the current Hunter meta (both of which currently need improvements): don’t let your opponent play their Hunter cards (Spy archetype) and this Guardian-themed Bodyguard concept, which spreads damage and keeps your effective figures alive. Most X-Wing Miniatures players know just how dang effective Biggs Darklighter can be by spreading out your opponents fire to keep an effective powerhouse alive, and I equate this Command Card to said mustached man. 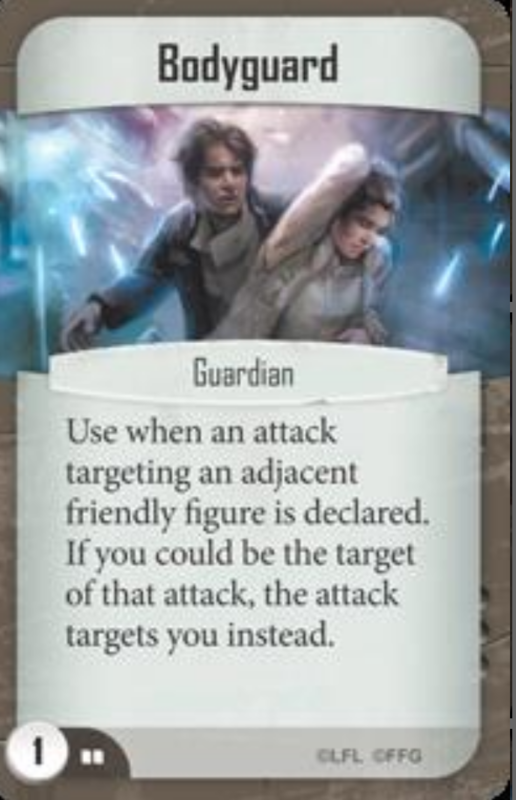 If the power in Imperial Assault stays the same and/or we get some new Guardian-traited figures that are well worth their costs, we will surely see Bodyguard get played in the years to come. Who knows- it may even become a staple!